An easy cheesy low carb tuna casserole with spinach recipe that can be made in no time. 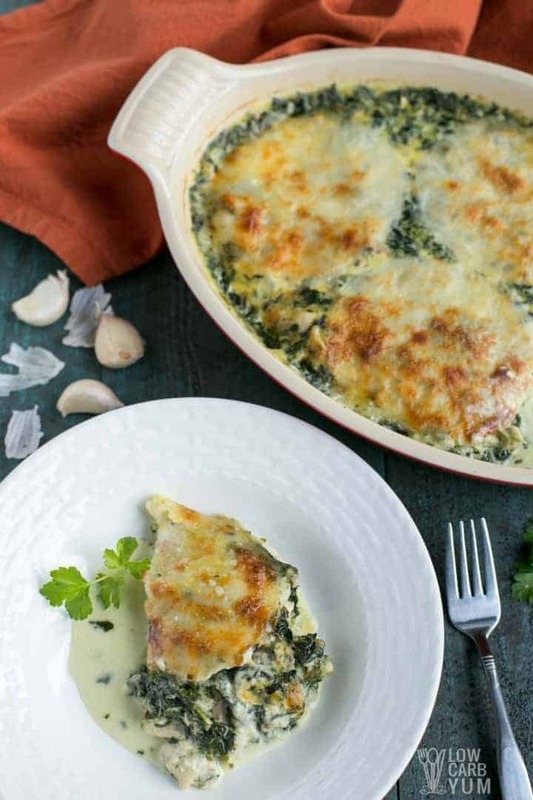 This dish uses canned tuna and frozen spinach with cream, almond milk and cheese. Every few months, I go through my cabinets and pantry closet to use up food that has been sitting for a while. I found some canned tuna that was still good, but getting close to the expiration date. During this time, I also go through the freezers and check for items that have also been sitting for a while. Way in the back was a package of frozen spinach that looked to be in good shape. 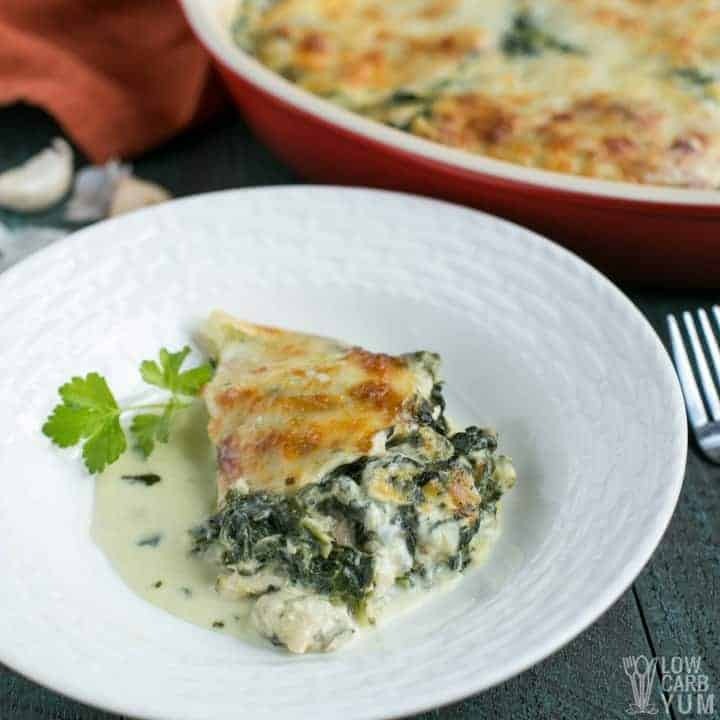 This easy cheesy low carb tuna casserole recipe with spinach is one of those dishes that was just thrown together to use up certain ingredients. In addition to the tuna and spinach, I also used up the rest of the grated Parmesan cheese I had in my refrigerator door. It was the fresh grated kind so I wanted to use it up before it got moldy. Don’t you just hate cleaning out the fridge and finding all the stuff gone bad that’s hidden in the back? I really should clean things out more often. The problem is that we tend to eat out a few times a week so the leftover boxes push everything back. And, we never eat all the food I cook so that pushes things back too. Since I’ve been trying to get more organized using digital calendars to schedule things. I’m putting routine things like kitchen cleanup on the calendar. I figure I should make it a routine item to go through the food before it has a chance to get bad. And, it gives me an opportunity to come up with a new recipe like this cheesy low carb tuna casserole with spinach. My father was always the cook at home and he was great about using everything up. However, he tended to buy a lot less than I do. There wasn’t a lot of money to waste on food so my dad was very frugal with everything he did, including his cooking. And it was rare that food ended up in the garbage. I find that I’m still a bit frugal even though I’m able to afford more than my parents could. But I do tend to buy a lot more food than my family can possibly eat. A lot of the food is used to develop recipes for the blog. However, I really should figure out a good way to make sure more of the food is consumed. I think doing an inventory of my food regularly will help. And I’m hoping to get better at buying just the foods that I need. 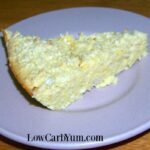 Although this casserole was thrown together to use up food that had been in the house for a while, it turned out absolutely delicious. Even my youngest daughter enjoyed this cheesy dish. In fact, I think this easy low carb tuna casserole is way better than the high carb one I used to make with egg noodles. 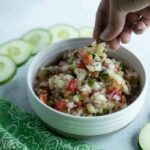 Because the recipe is one of those dishes that was just thrown together to use up certain ingredients, feel free to change it up to suit your own tastes. There’s plenty of wiggle room in this one. For those interested in making more of a traditional tuna casserole, you may want to check out the low carb tuna noodle casserole that uses shiratake noodles. This casserole is loaded with spinach so there no need (or room) for noodles. And, it’s a great way to get in your daily vegetables. I tend to keep frozen vegetables on hand. Although fresh spinach could be used in this easy cheesy low carb tuna casserole, it would need to be chopped first. That’s one reason why I like to keep frozen chopped spinach in the freezer. It’s great for saving prep time. 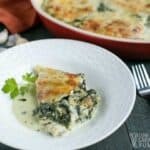 I also use it in my low carb creamed spinach recipe. I also like that frozen vegetables last a lot longer than fresh ones. There are times when I buy fresh vegetables for a recipe then get too busy to make it so they end up spoiling. 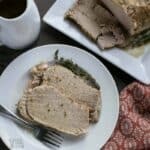 Canned meats are good to have in the pantry as they have a much longer shelf life. 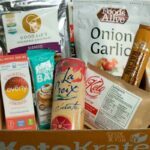 And they are great for making things like low carb salmon patties and Thai chicken salad. Do you have a favorite recipe using canned meat? A cheesy tuna casserole with spinach can be made in no time. 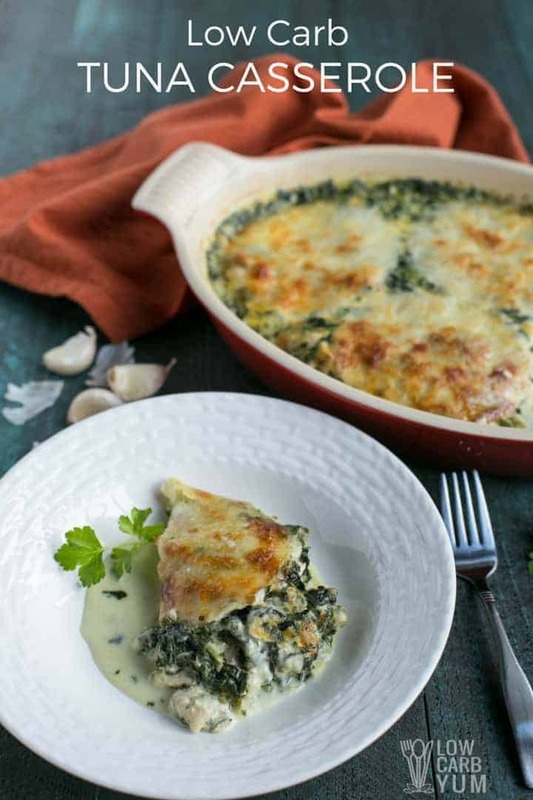 This dish uses canned tuna and frozen spinach with cream, almond milk and cheese. Melt butter in medium saucepan over medium low heat with garlic. When garlic is golden, add cream and almond milk. Stir over heat for 5 minutes then whisk in parmesan cheese. Stir in parsley, tuna and spinach. Cook over medium-high heat until bubbly, stirring frequently. Spoon into lightly greased or sprayed casserole dish. Top with sliced cheese, if desired. Bake at 375F for 20 to 30 minutes or until bubbly. For a thicker sauce, use a blend of heavy cream and cream cheese. 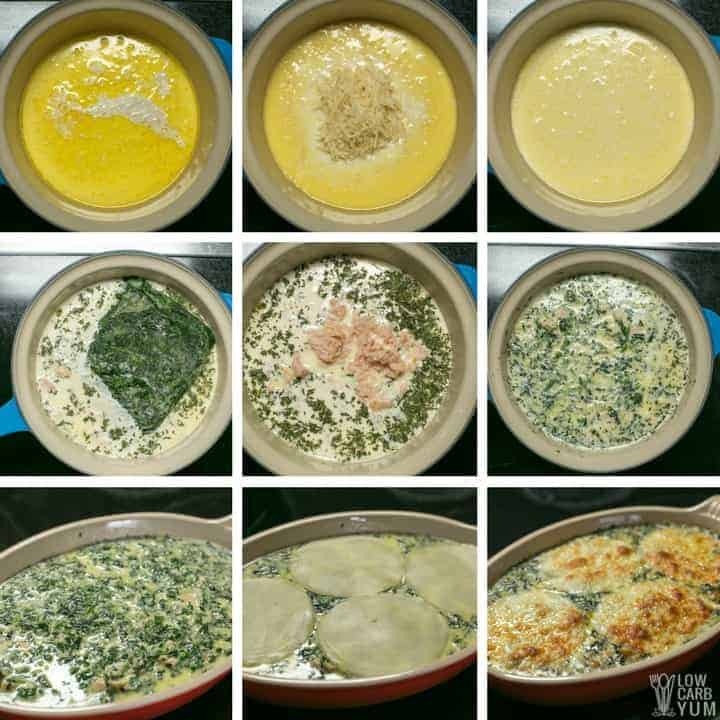 [post_content] => A cheesy tuna casserole with spinach can be made in no time. 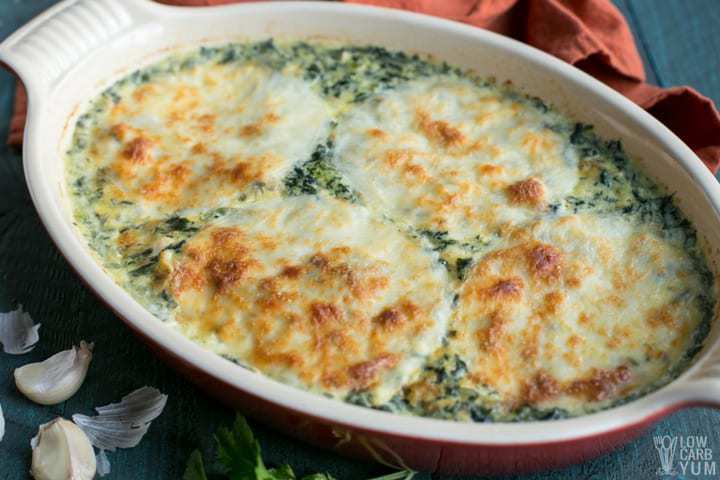 This dish uses canned tuna and frozen spinach with cream, almond milk and cheese.